The official website of Ministry of Human Resource Development is aimed to cater information and accessibility to various acts and rules, documents and reports, institutions, policy measures, circulars, orders and notifications as disseminated by the ministry for its most valuable resource i.e. Citizen of India. It gratifies with its rich content and quick navigation menu with news ticker and dynamism. The two departments namely Department of School Education and Department of Literacy and Higher Education are well categorized under two blocks that further delves into various schemes and projects, those being carried out at Elementary and Higher Level and playing a significant and remedial role in balancing the socio-economic fabric of the Country. Having conferred the Ministry status in 2011, the Ministry of Drinking Water and Sanitation is the nodal department for the overall policy, planning, funding and coordination of programmes of drinking water and sanitation in the country. The website of DDWS is having plethora of information and content including research papers, survey reports, documents, forms, plans and current financial and physical progress reports. As the water conservation and its resource monitoring have raised critical concerns in the present era, the MDWS website serves as a handy reference to case studies, agendas, annual reports and government initiatives as the lucidly rich content is well categorized and proficiently presented. The website serves as a web implementation of the motto of Department of Ex-servicemen Welfare, which is dedicated to look after the welfare, resettlement and rehabilitation of ex-servicemen (ESM), war widows and their dependents. The content rich and visually appealing website has been built with an aim to provide maximum accessibility and usability to its visitors by facilitating access to schemes and forms available for download. The website is continually updated with news and information, circulars and notifications, press releases and policy updates pertaining to the target beneficiary group. Detailed information on guidelines, policies and plans of Directorate General Resettlement, Kendriya Sainik Board, Scholarships and Health Schemes, Training Programs, Self Employment and Concessions etc is well presented and easily navigable. 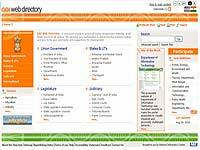 �india.gov.in�, the National Portal of India provides single window access to information and online services for the citizens and other stakeholders. The portal provides a unified interface to over 5000 Indian Government websites and is a Mission Mode Project under the National e-Governance Plan (NeGP). It provides comprehensive, accurate, reliable and up-to date information about India and its various facets with exclusive selections on Citizens, Business, Overseas, Government, Know India Sectors etc. Website provides information about the functions of the Department of Information Technology with a more detailed guidance about the Department's Vision and Mission of nurturing e-Governance in India. The website has useful information about various fields of activity of the department like Cyber Laws & Security, Acts & Policies, e-Infrastructure, e-Governance, Research & Development . The website is not only easy to navigate but is also friendly to screen readers and has a host of features enhances usability and fosters user comfort for the differently-abled like changing contrast, decrease/increase font size and text spacing. Ministry of Finance, Govt. of India has recently launched its disabled friendly website. Through this website the ministry expects to raise citizen service standards and enhance the efficiency in information delivery. The content rich and visually appealing website has been built with an aim to provide maximum accessibility and usability to its visitors. The website has also added informative sections for various target audience like business, citizen and employees. Sections like documents and reports, speeches, recent updates and press releases are also incorporated on the site. The who's who section of the site gives up to date information on the contact details of all the functionaries and officials of the Ministry. The website gives full report of the Union Budget. The content is updated and maintained by the Ministry. The objective behind the Directory is to provide a single point source to know all about Indian Government Websites at all levels and from all sectors. An attempt has been made through this directory to provide comprehensive, accurate, and reliable and one stop source of information about Government websites in India.The GOI Directory lists the Indian Government websites under the following domains : Union Government, State &Union Territory Government, District Administration, Judiciary, International, Sectors. The content in this Directory is the result of a collaborative effort of various Indian Government Ministries and Departments, at the Central/State/District level. The National Advisory Council (NAC) has been set up as an interface with Civil Society. The NAC would provide policy and legislative inputs to Government with special focus on social policy and the rights of the disadvantaged groups.The NAC comprises distinguished professionals drawn from diverse fields of development activity who serve in their individual capacities.The newly launched website of NAC provides information on the activities of the committee along with the profile of its distinguished members.The site also provides the contact details of the key functionaries of the NAC Secretariat. Ministry of Social Justice and Empowerment aims to facilitate the integration and empowerment of sections of society vulnerable to marginalisation and denial of social and economic rights. The website of Ministry of Social Justice and Empowerment is the first website of a Ministry of the Government of India to fulfil accessibility norms for Persons with Disabilities. This website has been re-designed so as to meet the Guidelines for Indian Government Websites and also adheres to Level AA of the Web Content Accessibility Guidelines (WCAG 2.0) of the World Wide Web Consortium (W3C). The website is friendly to screen readers and has a host of features that make it accessible to the differently abled. The user can adjust contrast, decrease/increase font size according to their need. The whole site can be operated by key board alone. The site, in particular, provides information about the functions of the Cabinet Secretariat with a more detailed guidance about the allocations of business rules of the government of India. Within the site, information about the Cabinet Secretariat�s Committee on Disputes, Press releases, Tenders, Circulars and RTI are also made available. This easily navigable and visually appealing website of Cabinet Secretariat render a slew of information from its different sources such as the department of Public Grievances, Department of Performance management and Govt. of India Web Directory. Every citizen has this right to know about the government and its role and function. The newly added section RTI Complaint & Appeal in National Portal of India is a valuable attempt in this process and a one stop source for all queries related RTI complaint & Appeal. The section not only provides all the RTI act information but also caters to a slew of ways to access these informations substantially viz., when to file and lodge a complaint, draft a complaint, check complaint status. Besides, one can also access information on when to file and submit an appeal, check second appeal status etc. To enrich your knowledge more on RTI Complaint & Appeal log on tohttp://rti.india.gov.in/.